An OCS reader asked me this question: Sometimes people ask me "how much CM (in USD) is achieved today in your factory". It seems confusing to me. Would you please tell me how can I calculate CM in daily basis? And why I need to calculate every day? On daily basis you calculate line output. And you have the SAM for the style(s) you are making in the line. With these data you calculate how much SAM is produced by the line. If you have this information, calculation of CM achieved by the line in dollar is an easy task. Read this post to know how. I will show you two different ways for calculating CM earned amount by the line. These methods can be used for calculating CM achieved by the factory as well as CM achieved by the line. In the costing sheet you include product CM cost, which is your garment manufacturing cost per unit. CM cost is part of FOB. Most of the time CM cost per garment is shared with buyer (in open costing). So you need to know CM cost per piece for the product you are making. Buyer pays you CM on total quantity you shipped. Therefore every piece you produce, you are virtually earning dollar equivalent to CM. In this method CM earned is calculated as total line output (pieces produced by the line) multiply by CM cost per garment. If you want calculate CM achieved by your factory then find total production done by the factory and multiply it by CM cost. From cost sheet collect garment CM (CM is fixed for an order). This data is normally available with merchandiser. In case cost of manufacturing is in local currency, convert it into dollar using currency ratio. There is a second way of calculating CM earning (CM achieved). 'CM achieved' can be defined as total calculated earned amount by a line which derived from total minute produced by the line multiply minute cost. 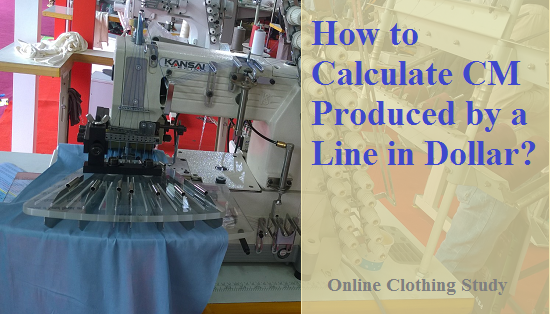 In apparel production when you are running a line, direct cost is involved in operators’ salary. And every factory has a minute cost (labour cost per minute for direct labours). To make it simple, you are paying salary to your operators and workers. In return operators are producing garments. To compare how much you getting return in dollars by paying operators wages on a day CM earning is calculated. 1. ​Calculate labour cost per minute of your factory based on minimum wages (in USD) of the workers at 100% performance. This factor changes when worker’s salary is changed, otherwise cost (dollar) per minute remain same. On daily basis calculate total standard minutes produced by a line and total garments produced by the line. I hope you do this every day. So whenever you are asked this question, just follow one of the above methods. To make the calculation simple follow first method. Multiply CM cost (Dollar per garment) to the pieces produced by a line to calculate CM achieved by your line. Why you need this figure daily? In a line, every day you are spending money (dollars) as workers’ salary. You should know how much dollars you are earning on daily basis against the dollar you are paying to your workers. You also need to check the progress if earning is increasing or not after loading a new style in a line? That is why you need to measure CM achieved on daily basis. Do you find this helpful? Share it with your peers and share knowledge. Online Clothing Study: How to Calculate CM Produced by a Line in Dollar? Method of calculating CM achieved by line and excess dollar paid to workers are explained.